Please Note: All lynx bases are profiles on the underside to match the firearm action and are predrilled to match (comes with screws) Where the firearm has a dovetail on top the bases are machined to match that dovetail Lynx stud bases only accept Lynx stud rings ..
One-Piece Picatinny Style Tactical Bases Full reciever length bases Fits standard dovetail or Picatinny style rail CNC machined T-6160 aircraft aluminum Tapered tip and tail eliminates sharp edges Mounting screws included ..
Remington 700 LA – 20 Moa – 180mm in length fits both left and right hand actions Please Note: All lynx bases are profiles on the underside to match the firearm action and are predrilled to match (comes with screws) Where the firearm has a dovetail on top the bases ar.. 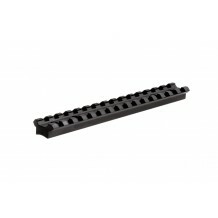 Fits Rem 700 LA – zero Moa – 180 mm in length – fits both left and right hand actions Please Note: All lynx bases are profiles on the underside to match the firearm action and are predrilled to match (comes with screws) Where the firearm has a dovetail on top the base..
Rem 700 SA – 20 Moa – 160mm in length – fits both left & right hand actions Please Note: All lynx bases are profiles on the underside to match the firearm action and are predrilled to match (comes with screws) Where the firearm has a dovetail on top the bases are ..
Rem 700 SA – zero Moa – 160mm in length – fits both short and long actions Please Note: All lynx bases are profiles on the underside to match the firearm action and are predrilled to match (comes with screws) Where the firearm has a dovetail on top the bases are machi..
One-Piece Picatinny Style Tactical Bases Full reciever length bases Fits standard dovetail or Picatinny style rail CNC machined T-6160 aircraft aluminum Tapered tip and tail eliminates sharp edges Mounting screws included Plea..
Remington 700 SA/LA Made from hardened aircraft aluminum Satin black finishMulti-slot, extra-long base sections Standard dovetail specs; Pictinny style Mounting screws included Please Note: All lynx bases are profiles on the underside to match th.. Please choose your purchase carefully. We exchange faulty goods - but do not exchange goods or refund money because of change of mind or incorrect purchase.